When Marco Polo released their recording of Cowen�s Third Symphony I�m sure many of us had hopes for a cycle of the surviving symphonies � the first two of the six appear to be lost. Nothing though was forthcoming and it�s taken the ever-enterprising and brilliantly committed ClassicO to get to grips with the Sixth in their British Symphonic Collection, of which this is volume fifteen. They�ve coupled it with Coleridge-Taylor�s youthful Symphony in A minor and both constitute world premiere recordings. 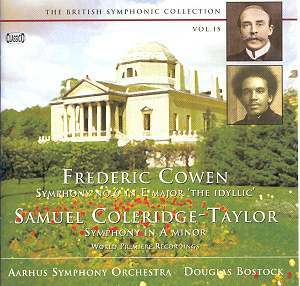 Both works were almost contemporaneous, the Coleridge-Taylor having been written in 1896 and Cowen�s Symphony the following year. The influences are I suppose the standard Continental ones � Dvoř�k on Coleridge-Taylor and Mendelssohn on the considerably older Cowen. In the case of the older man one finds a tremendous sense of warmth of utterance and lightness of orchestration. Cowen �s deft use of winds is a characteristic feature of his writing. He�s also not averse to a strong role for the horn, both features of the opening movement. It�s not surprising then that the cor anglais leads in the Allegro scherzando where there�s just a shimmer of the Iberian in Cowen�s rhythms alongside that precise and gossamer orchestration. The broad string tone of the slow movement even manages to irritate annotator Lewis Foreman who finds the composer�s "good manners and self control" rather limiting. Still, the horn and clarinet writing is impressive enough, and the climax, when it arrives, is powerful rather than merely exhausting. I find the modality of the writing even glancingly suggests O Come, O Come, Emmanuel in its burnished austerity. The ceremonial march of a finale has its share of elegiac lyricism, some of it somewhat Elgarian. There are in fact certain thematic patterns and rhythmic similarities; at one point I was even reminded of the Symphonies. But overall lies Cowen�s benevolence and sympathetic generosity � the cantilevering winds and reassuringly warm horn writing, the well distributed sectional writing. Certainly The Idyllic is an aptly chosen title. Coleridge-Taylor�s early Symphony is cut from a different cloth. Again it�s in four movements, the finale of which never satisfied the composer�s teacher, Stanford. To such an extent in fact that three versions of the finale exist; the one in the manuscript at the Royal College of Music is the one performed here. At one college run through Hans Richter was present and in the orchestra playing it sat Holst playing the trombone and Vaughan Williams the triangle. The Dvoř�kian elements are stamped from the first but Coleridge-Taylor had even at this youthful stage cultivated his own brand of genial tension; the climax in the opening movement for example is exceptionally well worked. The rather sonorously titled slow movement � it�s a Lament; Larghetto affetusoso � turns out to be considerably less portentous than one might expect. Rather it�s full of warm string wash, flute riding above, and through the developing intensity there�s a role for solo violin. His characteristic gift for melodic beauty is always present. Perhaps the most distinctively Dvoř�kian movement is the Scherzo though this does have a rather charming pentatonic folk lilt that anchors it as much to native soil as to Bohemian. It�s all fresh air lyricism in the finale until the more reflective material into which the elegant music winds; the percussion and a final brass chord ends it without undue fanfare. Another splendid venture from Classico, then, restoring at a stroke, two contemporaneous and for so long unheard symphonies. Neither has had an airing for a century or so. Both have charm and merit, the younger man�s symphony especially. Cowen�s essentially reminiscent work also has something to tell us about his undersung place in the English symphonic tradition. And maybe there are trace elements of Elgarian writing as well. Fortunately the performances are nourishingly affectionate and subtle and no mere run through. Bostock directs with the acuity we have come to expect from him, pacing with care and giving due weight to winds and to the horns especially. Classico�s engineering team has done a splendid job not least with regard to sectional balance. Laudable and expert, volume fifteen in the series is a triumph of programming and imagination.